To start, it’s important for digital marketers to understand the types of marketing emails that businesses send. The key to success in email marketing is employing the right type of email at the right time. Check out the goals of three types of emails — promotional, relational, and transactional — and how they’re used in marketing strategy. 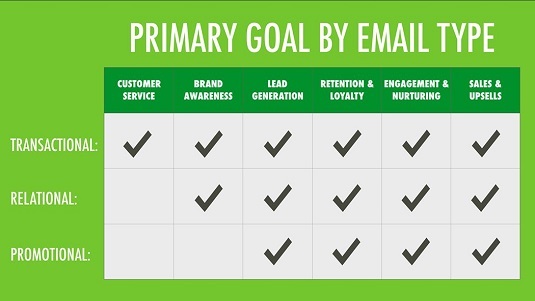 The primary goals of each email type. Promotional emails present the leads and customers on your email list with an offer. The offers could be promotional content, a gated offer like a white paper or webinar, a brand announcement, product release, event announcements, or trial offers, just to name a few. Promotional emails are the most common marketing emails. This isn’t surprising. Because 66 percent of consumers have made a purchase as a direct result of an email marketing message, it’s obvious that promotional emails work. Promotional emails provide value and help tee up sales. They’re great for lead generation, retention, loyalty, engagement, nurturing, sales, and upsells. They should be part of any email marketing strategy. The problem is that many companies use them as the only part of their email marketing strategy, so they miss out on opportunities to relate to customers in diverse ways that are often more effective. Relational emails deliver value to your customers by providing free content and information such as subscriber welcomes, newsletters, blog articles, webinar guides, surveys, social updates, contest announcements, and more. Relational emails may not sell a product or brand directly, but they build relationships with the customer by adding value upfront. For example, when your email subscriber receives a piece of high-quality content in an email newsletter, he or she is interacting with your brand in a deeper, more meaningful way. Transactional emails are sent in response to an action that a customer has taken with your brand. They include messages such as order confirmations, receipts, coupon codes, shipping notifications, account creation and product return confirmations, support tickets, password reminders, and unsubscribe confirmations. These emails reengage customers who have engaged with your business in some way and give the customer an idea of the voice behind your brand. Do you follow up quickly and deliver what you promised? Do you have systems in place that give the customer true value? Do you respect your customers’ wishes? The leads and customers on your email list are observing how you conduct business, and your transactional email is a big part of that. Transactional emails meet all the primary goals of marketing. They offer a customer service experience, tell customers about your brand, generate leads, increase customer retention and loyalty, engage customers, and even help with sales. Yet most businesses rarely use transactional emails properly, mistakenly assuming that promotional and relational emails are more effective. Research shows, however, that transactional emails have the highest open rates of the three types and produce 2 percent to 5 percent more revenue than standard bulk email does. Here’s an interesting conclusion: Transactional emails are chemically more likely to be successful.